The Uijae Museum of Art is located in Mudeungsan National Park, outside the city. It sits along a long straight road, mostly used by hikers on their path to the top of the mountain and by visitors of the Jeungsimsa Buddhist temple, where monks pray and live up in the forest far from the city. The museum’s collection is an homage to the famous Korean painter Heo Baekryeon, mainly consisting of traditional prints. While waiting for the artist’s public talk to begin, I walked around the temporary biennale exhibition that the museum was graciously hosting. I was pleasantly surprised by the harmony emerging from the space and its surroundings. Swedish artist Gunilla Klingberg had created an installation called When Stillness Culminates there is Movement. 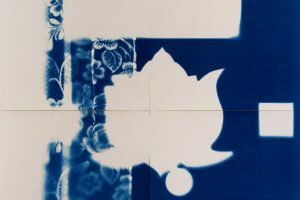 It was composed of two main elements: a bamboo curtain structure, fixed from the ceiling down to the gallery, and a collection of cyanotype prints on the wall. I talked to the artist before she made the presentation about her commission in the museum. Her main concern was to use a slow process, engaging conversation and exchange with handicraft and local people. She visited the exhibition site four times during her research and production phase, and stayed there on the mountain. She worked with a fortune teller, and the concepts of Feng Shui, in order to produce the installation. 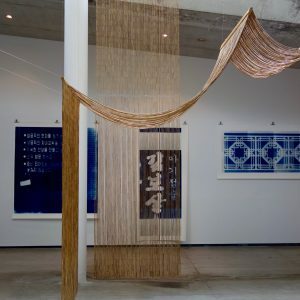 The blue prints presented in the exhibition space indicate the actual moments of the meeting with the fortune teller with Korean characters and numbers. The chemical process of making the prints is really fragile and ephemeral. The images are slowly revealed by the light of the sun. In the middle of the space, the bamboo curtains connect directly to the fortune parlours, as they are typically hung in the entrance ways. Klingberg used this material to make a floating sculpture in the museum space. This working process was marked by failures and successes that became a part of the construction of the final object, as an inherent part of its constitution, a form of knowledge built by making. The proposition engages the audience in a dialogue with the nature and the landscape in which the museum is situated, but also with traditional techniques. The artworks feel like they have been here forever. Site-specific commissions bring a different relation between the audience and the artworks. Klingberg creates a straight connection between tradition and our contemporary world, creating a bridge. Her installation creates a concrete situation, bringing to the forefront an opportunity for the audience to learn more about the local culture, habits and ways of image-making. I found each of these specific artistic commissions particularly interesting within the framework of such a large scale, institutional exhibition format as an Art Biennale. The Gwangju Beinnale is the biggest in Asia. In a recent Korea Times article about the 11th Gwangju Biennale 2016, it said it was “not spectacular but thoughtful”. It begs the question: Do we need it to be spectacular? This inquiry goes straight to the core of the curatorial idea, questioning the role of art, in a tangible reality.